This European and, in fact, international 23rd European Conference on Operational Research was organized by The Association of European Operational Research Societies and the University of Siegen, in close collaboration with the German OR Society. Herewith, that prestigous and celebrated meeting at the same time served to be the Annual International Conference of GOR. It took place in the south of Bonn, in two buildings, namely, the Maritim Hotel and the Gustav-Stresemann Institute. The particular motto of EURO 2009 was »OR Creating Competitive Advantage«; how this device became truly satisfied will be discussed in this report. The Programme and Organising Committee prepared a high quality academic programme of the conference. In addition to this, by the social programme and the tours offered, the participants had an excellent opportunity to exploit the city and vicinity of Bonn. A history of more than 2000 years has given the city most appealing and memorable facets. Bonn is an international center of science, arts and politics. The scientists who came from all over the world enjoyed the picturesque impressions along the romantic Rhine, Bonn’s international and political life or the magnificent Ahr wine region. Culture is inseparably linked to the works of Ludwig van Beethoven, but also of Robert Schumann, August Macke and Ernst Moritz Arndt. who presented some new advances in the theoretical foundations of OR, their complexity and practical implications to genetics and other areas. We shall return to this speech later on. In addition, the annual awardees of EURO and of GOR, respectively, gave their special presentations, as being detailed later on. 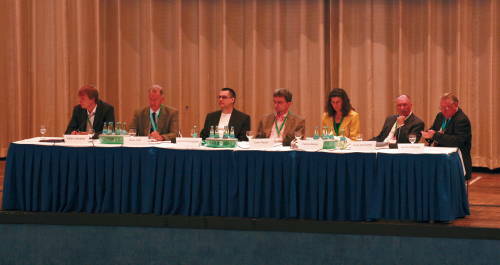 This conference was the 23rd European Conference on Operational Research. As all its predecessors, it was organized by EURO together with a local organizing institution which this time was the University of Siegen whose local core team around Prof. Dr. Erwin Pesch and Prof. Dr. Peter Letmathe served really tremendously, and with the close involvement of a national OR society, in our case: of GOR. In fact, preparing and conducting of EURO 2009 benefitted a lot from the great experience, vivid scientific life and excellent organizational structure of GOR. EURO 2009 was the second EURO conference held in Germany; the first one, EURO XI 1990, took place in Aachen. The strong contribution to EURO 2009 given by EURO expressed itself in a multitude of services, from financial support, logistic aid, e.g., the very developed and user friendly abstract submission system, to the excellent scientific communities in EURO, in particular, its national OR societies and EURO Working Groups. They fostered a lot the announcements, invitations and the gaining of so many friends for coming to our EURO conference in Bonn. For example, GOR advertised EURO 2009 generously by high quality announcements in its OR News, and GOR and other distinguished national OR societies reserved time slots for invitations to EURO 2009 in the programs of their annual conferences in the previous years. The service of EURO and GOR goes on by special issues of their journals devoted to our conference in Bonn. 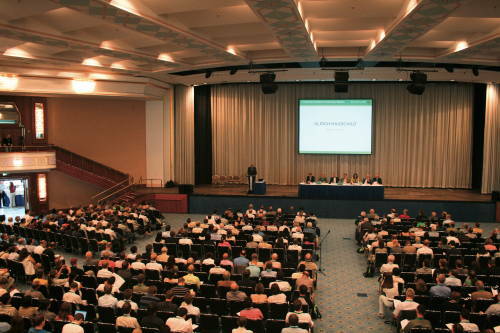 The EURO conference was accompanied by a number of satellite events – scientific workshops which benefitted a lot from the local closeness to EURO 2009 and which, in reverse, attracted further friends to join the entire experience of the EURO conference. These satellite events were organized by some EURO working groups, but also by several companies, mostly from the sectors of software prepared for modern OR in fields such as, e.g., optimization, modelling and traffic. Those companies further served as sponsors so that the conference organization and the participation of colleagues from developing and emerging countries became very much facilitated. The workshops prepared by EURO working Groups (in short: EURO WGs) were 7th EUROPT Workshop Advances in Continuous Optimization, University of Applied Sciences, Rhein-Ahr Campus, Remagen (near Bonn), Germany, July 3-4, 2009. A EURO ORD Workshop on OR for Developing Countries Young Researchers and PhD Symposium, University of Applied Sciences, Rhein-Ahr Campus, Germany, July 4, 2009, and State-of-the-Art Workshop Mutual Session of Special Researchers of Several Euro Working Groups: OR for Development, Ethics, Decision Making, Methodology of Societal Complexity and others, University of Applied Sciences, Rhein-Ahr Campus, Remagen, Germany, July 5, 2009. GTS Workshop »An Introduction to Vehicle Routing and Network Planning with the Decision Support System TransIT«. Further meetings within of EURO, its leading committees as well as its working groups, of IFORS leaders, and the annual meeting of the members of GOR completed the list of special meetings held. On monday morning, the Opening Session, chaired by the OC and PC Chairs, Prof. Dr. Erwin Pesch and Prof. Dr. Gerhard Woeginger, and supported by OC Co-Chair Prof. Dr. Peter Letmathe, began with van Beethoven’s 9th Symphony. At this solemn occasion, the President of EURO, Prof. Dr. Valerie Belton, the Mayor of Bonn, Mr. Ulrich Hauschild, and the President of GOR, Prof. Dr. Horst Hamacher, gave their addresses, and most important awards in the life of EURO were handed out. In fact, Prof. Dr. Jakob Krarup became the first scientist in history who obtained the EURO Distinguished Service Medal; in this way, his outstanding contributions to our community became recognized. EURO’s most important scientific distinction, the EURO Gold Medal, was received by two colleagues this time. Following the laudatios, both of them gave their lectures: Prof. Dr. Jacques F. Benders (Eindhoven University of Technology, The Netherlands), whose presentation discussed most recent achievements is the light of his famous method, and Prof. Dr. Frank Kelly (University of Cambrigde, United Kingdom): »Models of Network Routing and Resource Allocation«. This morning ceremony, which was enriched by the vocal contributions of Mrs. Nadine Uebe-Emden (University of Siegen, Germany), also contained the disclosure of the GOR Scientific Award and the corresponding laudatio on the laureate for his outstanding contributions. In this year, the awardee with his speech on sympathy and sincere gratitude was Prof. Dr. Michael Jünger (University of Cologne, Germany): »Thank you Operations Research Community«. Dr. Sebastian Stiller (Berlin University of Technology, Germany): »Extending Concepts of Reliability Network Creation Games, Real-Time Scheduling and Robust Optimization«. The presentations of the latter for awardees were embedded into the conference programme. out of which Tobias Achterberg (Zuse Institute Berlin) was declared the winner of this year’s dissertation prize. Likewise for EDDA 2009, also for the following award, sessions were reserved at the second programme day of the conference. Wiebke Hoehn, Felix G. Koenig, Marco E. Luebbecke and Rolf H. Moehring: »Sequencing and Scheduling in Coil Coating with Shuttles«. From this selected group, Carlo Mannino (Universita di Roma »La Sapienza«, Italy) and Alessandro Mascis (Bombardier Transportation Italy) awarded EEPA 2009 at a solemn moment during the closing session of the conference, when also the EURO Management Science Strategic Innovation Prize became disclosed. The joint laureats of the latter prize were Lars Kjær Nielsen and Gábor Maróti (both from Erasmus University Rotterdam, The Netherlands): »Disruption Management of Rolling Stock in Passenger Railway Transportation«. For all these prestigous awards, various juries with their chairs served by careful evaluations, selections and laudatory speeches, and without sponsors from the industry, some of the prizes would not have been possible. The concluding session became completed by the sincere invitations to forthcoming core events under the umbrella of EURO, ALIO and IFORS, and to the ROADEF/EURO Challenge 2010 which has been prepared by our French OR colleagues. During the conference days, many outstanding keynote talks and presentations were given. Without setting any of these back, the plenary speeches of Nobel prize winner Reinhard Selten (BonnEconLab, the University of Bonn Experimental Economics Laboratory, Germany) and of Christos Papadimitriou (Computer Science Division, University of California at Berkeley EECS Department Berkeley, USA) were absolute highlights. While Prof. Selten presented a new and groundbreaking experimental study on goal formation and aspiration adaptation, Prof. Papadimitriou focussed his talk on computing equilibria and efficient algorithms to find them. Referring to equilibria such as mixed Nash equilibria and price equilibria, he gave excellently surveyed complexity results as well as recent algorithmical advances in this field. The statistics of EURO 2009 discloses that 2446 participants from 73 countries came to our EURO 2009 in Bonn. In the »ranking« of the nations, the German delegation – the one of the »host family« – was the largest. The »silver medal« was awarded by the friends coming from Turkey! This may serve as an expression of the fruitful partnership which is established between GOR and the OR Society in Turkey (ORST) in the days when Prof. Dr. Gerhard Waescher was the president of GOR, and which became very much supported by him and his successors, Prof. Dr. Thomas S. Spengler and Prof. Dr. Horst Hamacher. In fact, the partnership of GOR to the national OR societies in its neighbouring countries contributed likewise strongly. That so many participants from Turkey could attend the conference is very much owed to an extra sponsorship given for their participation by EOARD (ONR Global). For getting an impression of how high the Turkish delegation enjoyed and appreciated that they could be with us in Bonn, citations of three members may be given. They were stream organizers at the same time, and have academic backgrounds in different departments. contributions to the solution of realworld challenges such as represented by the Millenium Goals of the United Nations which concern the development of the poorest nations, to overcoming the present crisis and builing up future markets in the financial sector, by new methods in healthcare, traffic control, in the environmental sector and the use of natural ressources, in the implementation and future use of hightech solutions in industry, in the service sector and the private life of future generations, in strategies of fruitful collaboration and peaceful overcoming of conflicts. Careful announcements and calls for papers, took the message of EURO XXIII 2009 to all the corners of the world. This flow of information and process of invitation was very successfully supported by our rich community of stream and session organizers, of EURO’s national OR societies and WGs, by ALIO, INFORMS … the entire IFORS family, and by all the other partners and friends of our conference from all around the world. So the organizers and all the friends of German OR were very grateful and proud to welcoming about 2,400 participants to Bonn, Germany, the biggest attendance and wealthiest one in terms of the scientific programme in the history of EURO. The organizers of EURO 2009 have expressed their cordial thanks to all the collaborators on all the various levels and to all conference participants for their being with us – and in Germany, their kind interest, for their generous support, enthusiasm and joy which altogether made EURO XXIII 2009 become a great festival and success. To this success of EURO 2009, to its atmosphere of mutual support, to carefully implementing it as well as to its spirit of common sense, encouragement and new experiences made, the »green angels« – mainly students from Siegen and Bonn – contributed with exceptional care and friendliness. In fact, the green angels took care of the class rooms, the technical equipment, and they served as contact persons to the organizers on any kinds of concerns. But quite a number of those »green angels« came from abroad, from weak currency countries; they had received financial support and then, in reverse, did an important work which helped that the conference was running so well, reliably, joyfully and successfully. The social programme provided several highlights and made the conference even more vivid. On sunday evening with a typical German beergarden evening in the Rhineaue, more than 1500 participants celebrated the start of the conference with beer and good food. 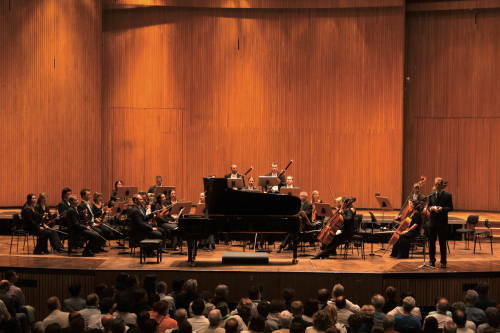 Introduced to Germany from this more casual side, the classic concert performed by the Beethoven Orchestra in Bonn’s Beethoven Hall was the cultural highlight of the social programme. 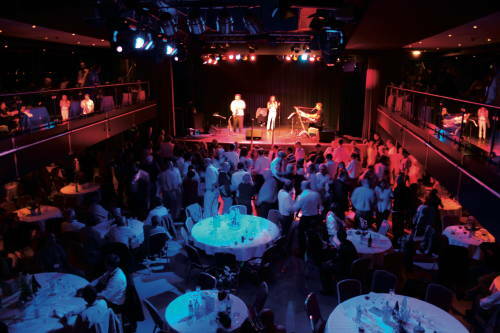 The conference dinner was served on the biggest Rhine cruising boat, the Rheinenergie, and created a unique atmosphere to enjoy the very traditional German landscape along the Rhine river. The boat turned back to Bonn at a point which is not far, just some 20 km away, from where Fürst (Prince) Klemens Wenzel Lothar von Metternich was born, a leading European politician at the time of the Congress of Vienna. That congress was characterized by the Belgian diplomat Charles Joseph, 7th Prince de Ligne who said »Der Kongress tanzt«. These words became a bon mot, and they perfectly suite to this mild and wonderful summer evening on the river of Rhine, social highlight of EURO 2009, too. But differently from de Ligne’s words which fully read »Der Kongress tanzt, aber er kommt nicht voran« (»Le congrès danse beaucoup, mais il ne marche pas«), about our EURO XXIII 2009 in Bonn, Germany, we may truly say: »Der Kongress tanzte und wir kamen sehr gut voran!«. The author of this report expresses his sincere gratitude for confidence and various helps to all the local organizers of EURO 2009, especially, Prof. Dr. Erwin Pesch and Prof. Dr. Peter Letmathe, to the board of GOR, especially, its president Prof. Dr. Horst Hamacher, to the editorial team of OR News, Dr. Joachim Minnemann and Dipl.-Ing. Christiane Pientka, and to some friends from Turkey who contributed to this report: Prof. Dr. Gülser Köksal, Assoc. Prof. Dr. Inci Batmaz, Dr. Süreyya Özögür-Akyüz, MSc. Basak Akteke-Öztürk and MSc. Fatma Yerlikaya.